Every year, I read as many novels by Latino authors as I can, so long as I’m interested in the particular titles, and so long as the characters are also Latinos. It’s important to me to read novels with characters that I can relate to, because we share a cultural background. All They Will Call You, by Tim Z. Hernandez, is actually a fictionalization of a real event that occurred in the 1940s, the crash of an airplane in central California that killed the crew and passengers, who were undocumented workers. This is a heartbreaking, beautiful telling of a not well-publicized tragic event. The Inexplicable Logic of My Life, by Benjamin Alire Saenz, who is a popular YA author. I didn’t care for the story’s meandering style, but its characters are well-written. Haters, by Alisa Valdes, is another YA title and one I quite enjoyed. Valdes is a good writer, and her books, including this one, are page-turners. Eulogy for a Brown Angel, by Lucha Corpi, is a mystery set in 1970s’ Los Angeles and San Francisco, with the Chicano Moratorium march serving as a background for the murder of a child. It’s a slow-moving but interesting read. I Am Not Your Perfect Mexican Daughter, by Erika Sanchez, is another YA page-turner that focuses on the topics of teen suicide, Mexican culture, and the search for self-identity. This entry was posted in Uncategorized and tagged Latino fiction on December 1, 2017 by lchavezdoyle. I’m a big fan of public libraries. Of course I am. I worked in libraries for many, many years: small ones, big ones, poor ones, not-so-poor ones. Now I visit the library regularly, and it’s where I obtain most of my reading material. Unfortunately, despite living in a large city with a main public library and several branches, too often I am unable to find the books I want to read. I read a broad range of fiction–mysteries, bestsellers, literary, horror, and some sci-fi–and often want to read books by Latino authors. I’ve blogged before about the shortage of novels that deal with Latino culture, written by Latino authors. When I come across a title I’m interested in, I always check the library first for availability. The other day I searched my local library system for Chicana Falsa, a book of poetry and short stories by the renowned Chicana author Michele Serros. To my disappointment, I found the library doesn’t carry it. A few weeks back I searched for The Amado Women by an up-and-coming Latina author Desiree Zamorano. Again, I did not find it at my city’s library. Curious, I checked for the classic Chicano novel Pocho, by Jose Antonio Villarreal. It wasn’t in the collection either. In a city that is at least 40% Latino, I would expect the public library to not only have these books at its main facility but at most of its branches, too. Fortunately, I live near a very large county library system with numerous branches (almost 100). I found Chicana Falsa at about ten of those facilities. The Amado Women is only at two. Pocho is more available, located at approximately twenty of the libraries. I could drive twenty miles to the East Los Angeles Library and find all of those books, but why should I have to do that? There is a reserve system, of course, that allows users to request specific titles to be delivered to their local branches, but that still isn’t sufficiently serving the population. Readers often discover titles by scanning the book shelves at their local libraries. I believe books about the Latino experience should be more readily available to readers of all backgrounds. 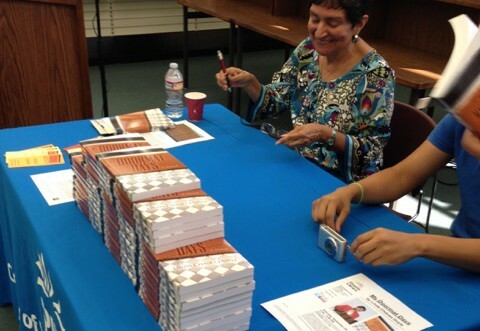 Why limit these books to Latino communities? Ernest Hemingway’s books, for example, are not limited to primarily Caucasian communities; his works are made available in most, if not all, public libraries. How do we expect readers, especially young readers, to be exposed to other cultures and ethnicities through literature if we don’t make the material available to them? This entry was posted in Uncategorized and tagged Latino authors, Latino fiction on July 15, 2016 by lchavezdoyle.